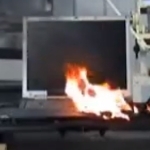 PC Safety batter fire, exploding battery, exploding laptop battery, lithium ion, pc safety. permalink. It is very rare but everyone should very careful about charging you Laptop batteries, Optimize your batteries uses, remove unnecessary charging , and unnecessary connecting laptop to plugged , just follow the one thumb rule that is charge your batteries then use it without charging, and when 10 to 15% remaining recharge again. that the flying a small infrared controlled helicopter with a weak lipo battery. I decided to change it. Took the helicopter, apart, and removed the battery. The battery seemed warm and puffy so to play safe. I put it in the bathroom sink. As I was putting in another battery, I heard a bang in the bathroom. Sure enough, the battery exploded. How then do we determine when our L I battery will fail? How do we prevent it? Final analysis “It is possible that a lithium type battery or batteries, for reasons which cannot be established, went into an energetic failure characterised by thermal runaway and auto ignited starting a chain reaction which spread to the available combustible material,”. So actually they have no idea if something else started the fire first and it spread to the "lithium type" battery, as they are speculating. All instances of lithium battery related fires on planes read the same way.Speculation, no confirmation of a lithium battery STARTING the fires has yet been proved. Including the Dubai, and Norwegian flights. The Boeing 787 Dreamliners that were grounded due to a smoking lithium battery, was the plane's actual battery, not a cargo battery. Michael Flanagan hit the nail on the head with crazy outlandish created scenarios to purposefully ignite lithium batteries of various types. I do agree with the scare monger theory, but, laptop batteries are a regular recall. What does the average user do to protect him/herself? I suppose that there is a chance that high frequency radiowaves might cause them to explode. All very scary and dramatic. Typical news media stuff, show the worst possible scenario. Have you ever seen what happens to the good old lead acid battery in you car, when the terminals are dead shorted out. It's very spectacular. Also, have you seen the gas tank on a car explode…………..wow, far bigger and better than these pictures. Have you ever seen a plane crash and catch fire??? These are just sensational videos without explanation. Not worth too much. I read Steve’s comment before viewing the video, and was tempted to say “industry hack.” But, after viewing the video, I have to agree with him. Yes, some LiIon batteries have had problems. I have never seen a case-by-case cause analysis, just a bunch of over-hyped reporting. In the films above, all the fires/explosions were triggered by deliberate abuse and all took at least several minutes to start. That point is carefully buried under all the bright flashes and corresponding noise during the reporter’s presentation. The reporter says the FAA blames the batteries “partially for the destruction” of crashed planes. It doesn’t say the batteries burned and CAUSED the crash…but, yeah, if you drop a load of batteries (any type) from several thousand feet up, they are going to be damaged and may well explode and/or catch fire. they say when the batteries are overcharged…then what happened on a plane with a pallet load of batteries. They were not being charged so something else? It seems there is little data or anything said about the state the battery(s)are in at the time of incineration. If they are not physically overheated, it would appear little danger of incineration should occur. If being over-charged, then some regulations are certainly in order to limit chargers to remain charging when a battery sends back information that it is fully charged. So feedback from the battery should be a requirment in place to limit this liability. Certain things have to happen to Lithium based batteries for them to explosively burst into flames. They will ignite if they are MASSIVELY and inappropriately overcharged. This will not happen while you are running your laptop unless you jury rig an inappropriate charger and plug it into your laptop. it’s exceptionally unlikely to occur at all. The second is if you short the battery pack with a conductor that will draw enough power to vastly exceed the C rating of the pack. While it is plugged into your laptop this is impossible. Any wires capable of shorting the pack will be burned in two a long time before the pack itself is in danger of ignition. The third is if there is physical damage to the pack. In laptops the batteries are in hard plastic enclosures for the specific purpose of avoiding physical damage. Again, it is exceedingly unlikely that the pack would be physically damaged. Testing with hobby grade Lithium Polymer batteries shows that it is VERY difficult to get these batteries to burst into flame unless extraordinary steps are taken to make it happen so the result can be shown on sensationalist TV “news” shows. These are not news shows at all, they are gossip shows. This report is a perfect example of abdication of their former responsibility to inform the public of the truth.